Ajax post views counter is a feature of the Newsmag theme, which allows you to keep counting post views with cache plugins. Enabling this feature will update the post views count using Ajax on both pages and single post page. 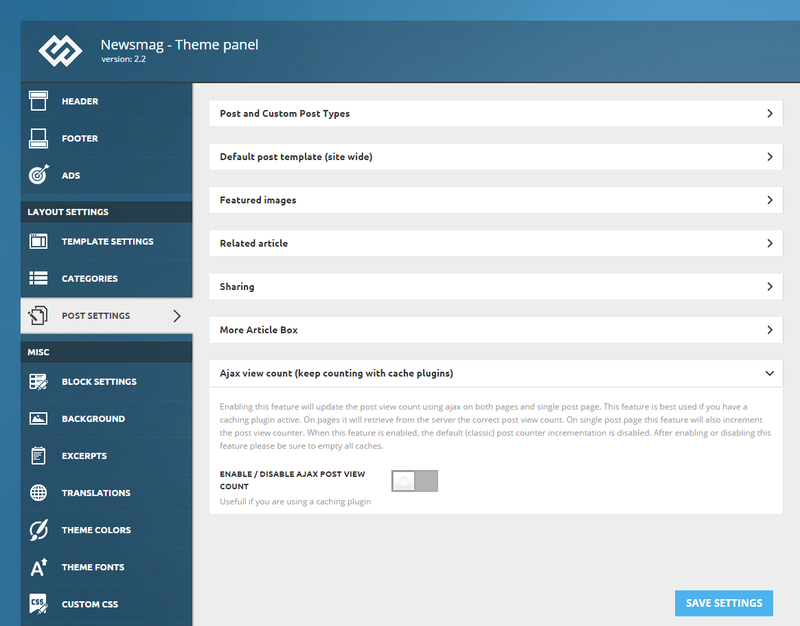 To activate these features, go to Newsmag > Theme Panel > Post Settings > Ajax view count, and click the button to Enable. After finishing, please click the Save Settings button.For the best results, use this feature only if you have a caching plugin active. On pages (modules) it will retrieve from the server the correct post view count. On single post page, this feature will also increment the post view counter. When this feature is enabled, the default (classic) post counter incrementation is disabled. After enabling or disabling this feature, please make sure to empty all caches.